SAO TOME, Aug 24 2009 (IPS) - If you live in São Tomé, a good investment in your health is to plant a po-sabom tree (Dracaena aroborea) in your backyard. Leave space: it can grow up to 20 metres high, with sword-shaped leaves. The local stiljon, or traditional healer, has many uses for po-sabom. For toothache, drink tea of its bark and roots. For skin itches, whip bark in water until foamy, then bathe. For a wound, apply a poultice of leaves and bark. If you are horny, its bark and roots, mixed with alcohol will boost your powers. The forest is the pharmacy on the two tiny Gulf of Guinea islands of São Tomé and Principe; and traditional healers are the experts on its plants. Over 14 years, Maria do Ceu Madureira, a Portuguese ethnobotanist, had led a research team from the University of Coimbra and the Ministry of Health of São Tomé, with funding from the Calouste Gulbenkian Foundation in Lisbon. Her ethno-pharmacological study, published in 2008, pulls together traditional knowledge and modern science. Madureira was fascinated with the richness of the local flora and worried that elderly healers are dying without disciples. “Their knowledge is disappearing faster than the forests,” says Madureira. The study collected information on 325 medicinal plants and more than 1,000 medicinal recipes from some 40 respected healers, midwives and grandmothers. The plants were identified, classified and compared to similar plants studied elsewhere. When pharmacological and phytochemical analyses were performed on fifteen plants, they showed potential to develop new medicines for old diseases. Po-sabom looked promising against malaria and leishmaniasis, and effective against 14 fungi and four bacteria, including candida albicans, a frequent cause of oral and vaginal infections among HIV-positive people. Thirteen plants are effective against the plasmodium falciparum malarial mosquito. Other plants have anti-bacterial, anti-histamine, anti-diarrhoeic, anti-tumour, pain-killing and sedative properties. “Empirical knowledge was checked with scientific methods in the laboratory and we found the therapeutical value of plants,” says Marcelina Quaresma Jose da Costa, from the pharmacy department at São Tomé’s ministry of health. The rich biological diversity on São Tomé's two tiny islands includes more than 700 botanical species. Of these, 95 are endemic to São Tomé and 37 to Principe. Others were brought from Latin America, Europe, Asia and mainland Africa by the Portuguese, who landed here in 1498, and turned the uninhabited islands into a hub for sugarcane, coffee, cocoa and the slave trade. This makes São Tomé and Principe a treasure trove, especially in the areas of primary rainforest known as Obō. This is unsurprising. Healers treat burns, snake and insect bites, warts, asthma, sexually transmitted diseases, diabetes and high blood pressure, among others. They fix bones and massage pains away. 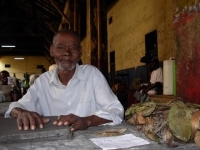 At his stall at the central market in São Tomé, 78-year-old Francisco Sousa Carvalho sells leaves, roots and barks; the most popular are those against fever, high blood pressure and diabetes. His teeth are gone and his bones hurt: “This I can’t cure, it is old age,” he laughs. Too feeble to go into the forest, he sends others to find the plants, but says it is getting harder to find them. Sousa Carvalho, know as Sum (or, healer) Gino, is one of three healers credited as co-authors in the study. Book profits – and Madureira’s compilation has practically sold out in Portugal and São Tomé – have gone to fix and equip the homes of healers and pay them a monthly stipend. Another co-author is Lourenco de Sousa Pontes Junior, still sprightly and strong at 82. His wooden home stands amidst a palm grove in Bobo Forro, São Tomé. He sees his clients in a small room. “This project is saving our knowledge for future generations,” said Lourenco de Sousa Pontes Junior. His specialty is massage and is reputed as an expert on barks. Pontes regrets that the young are not interested in learning his craft, and fewer clients come to him. The Portuguese banned traditional medicine and the post-colonial Marxist government despised it. “Traditional healing is losing ground,” he says. Perhaps this trend could be reversed. Da Costa, who studied in Cuba, is one of São Tomé’s three pharmacists. The other two are retired. Da Costa, 54, would like to go on pension too, if a replacement could be found. Young saotomenses have gone abroad to study pharmacy in Brazil and Portugal, but none has returned, she says. Da Costa has come to invite Pontes to do a display and speak about his craft at an exhibit she is organizing for the Week of African Traditional Medicine, Aug. 24-31. The old can teach the young the secrets of the rainforest and help find new medicines for old diseases.